Eddie Sáenz of Edinburg addresses several hundred voters on Thursday, October 25, during his campaign kick-off for state representative, House District 40, which includes all but southwest Edinburg, La Joya and Sullivan City in western Hidalgo County, Edcouch, Elsa, La Villa, and San Carlos in eastern Hidalgo County, and northern Hidalgo County. Sáenz, a Democrat, is portraying incumbent Rep. Aaron Peña, D-Edinburg, as loyal to the Republican Party, criticizing Peña for helping keep a Republican in power as Texas Speaker of the House. “Our great state senators and South Texas representatives need a partner working with them in Austin. We need to elect a Speaker who is for everyone,” Sáenz said. “That is why I am committing to stand with the Democratic Caucus, and support a Democrat for Speaker that we can all stand behind.” See story later in this posting. 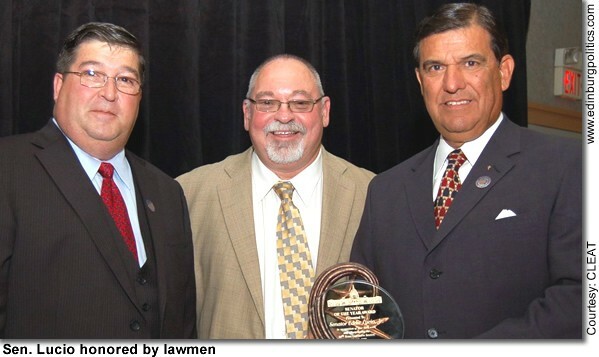 Combined Law Enforcement Associations of Texas (CLEAT) President Chris McGill and CLEAT Political Director Charley Wilkison presented Sen. Eddie Lucio Jr., D-Brownsville, featured right, with the Senator of the Year 2007 award at CLEATS 31st annual convention held October 6 in Brownsville. As a member of the Senate Finance Committee, Lucio pushed for an increase of $369.4 million in funds for the incarceration and treatment of adult felons. He also helped secure $108 million for border security operations, including funding for local law enforcement surge operations, joint operation and intelligence centers, a border security operation center, additional Department of Public Safety troopers and more aviation support. See story later in this posting. A portion of the program cover for the November 15 Tejano Walk of Fame scholarship fundraiser provides a colorful preview for the event, to be hosted by The Social Club, an upscale restaurant located at 205 Conquest Boulevard in Edinburg. Hundreds of fans of the latest inductees of the Tejano Walk of Fame will be able to see their favorite musicians – at no charge – during the public portion of the popular event, which will be held outside The Social Club from 6 p.m. to 7 p.m. See story later in this posting. An exhibit titled “Pillars of Success” featuring the photos and success stories of five distinguished alumni of The University of Texas-Pan American opened at the University’s Visitors Center on October 11. Pictured from left are new UTPA “Pillars of Success” honorees Arturo E. Guerra Jr., Roberto Pulido, Dr. Marla M. Guerra, and Lucious “Luke” Jackson Jr. Not pictured is Major General William F. Garrison, who was unable to attend the Pillars exhibit opening. See story later in this posting. La Corte Superior de Texas es la arena legal más alta del estado para los asuntos civiles, y consiste de un jefe juez y ocho jueces asociados de la corte que son elegidos por votación estatal. Lloyd Criss, quien en la cámara fue presidente del comité de Relaciones Laborales y Empleo, trabajó de cerca en la Cámara de Representantes de Texas con la camarilla legislativa de mexicano-americanos, especialmente con el senador estatal Juan “Chuy” Hinojosa, Demócrata de McAllen, que en ese entonces fue un representante estatal de Texas incluyendo el ex representante estatal Alex Moreno, Demócrata de Edinburg, aprobando la legislación histórica para proteger millares de trabajadores agrícola en Texas contra la explotación económica, peligros de la salud, horas de trabajo injustas y también envenenamiento. “Es duro creer, pero es verdad, que la mayoría de trabajadores agrícola siendo mexicano-americanos fueron negados las protecciones básicas que cada persona tenía en ese entonces porque ellos no tenía ningún poder político, nadie para luchar por ellos,” dijo el juez Susan Criss. Ella casi ha servido una década en la corte 212th como juez de distrito estatal en el condado de Galveston. Como presidente del clave comité en la cámara, Lloyd Criss, utilizó su poderosa influencia política para aprobar proyectos de ley que fueron introducidos por Hinojosa y Moreno, dos creciente estrellas políticos que son campeones por las leyes que hoy se reconocen como “legislación histórica de los derechos civiles”, dijo el juez Susan Criss. Entre la clave legislación formado por Lloyd Criss, juntamente con Hinojosa, Moreno y también otros legisladores Latinos, hubo una ley estatal que hoy requiere que los trabajadores agrícola sean protegidos por el seguro de compensación para trabajadores en Texas, que es un seguro médico y de incapacitados para la gente que están lesionados durante horas de trabajo, dijo el juez Susan Criss. Asimismo, su padre ayudó en otros clave proyectos de ley, incluyendo una ley que eliminó el uso de un corto azadón por los trabajadores agrícola, una herramienta que resultaba en dolorosas lesiones permanentes de espalda para los usuarios. Él siempre apoyó los esfuerzos de eliminar una larga práctica de la rociadura aérea de pesticidas peligrosos sobre los trabajadores agrícola mientras ellos estaban dentro los campos, el juez Susan Criss agregó. Finalmente, Lloyd Criss, además lucho por una ley que hoy requiere baños públicos para los hombres y las mujeres en el sitio de trabajo, declaro el juez Susan Criss. Lloyd Criss, igualmente apoyó la legislación que proveyó beneficios del seguro de desempleo para los trabajadores agrícola, una meta que había sido buscada por cerca de 50 años. Este proyecto de ley fue muy importante que César Chávez, un fundador de los agricultores unidos de América y activista nacional de los derechos civiles, visito el capitolio en Austin de Texas para afirmar la legislación de Criss. “En mi vida personal y profesional, yo he trabajado esforzadamente para llevar la pelea de igualdad para todos, que es un principio inculcado en mí persona por mi familia, especialmente por mi padre,” dijo el juez Susan Criss. Anuncio político pagado por la campaña de Susan Criss. Tesorero, Lloyd Criss. P.O. Box 164474, Galveston, Texas 77552. The following obituary was published on behalf of Román David Delgado. Please be with our son, Román David. He lived a short and innocent life. He trusted You, Lord, and never doubted in his moments of fear he turned to You. He sought your protection through prayer and lived by Your truths. Lord, our God, Román stands with You in a safe place. You chose him for Your very own. Protect our beloved son, Román, hold him gently in your arms, and love him for eternity as we, his loving family will love him and hold him in our hearts forever. Thank You, Lord for the blessing of our beloved son and brother. – Rudy and Diana, Rudy Dan, Ricco Diaman and Ryan Diego Delgado. Román is survived by his parents; Judge Rudy Delgado and Diana Reyna Delgado from Edinburg, Brothers; Rudy Dan Delgado from Austin, Ricco Diaman Delgado from Austin, Ryan Diego Delgado from New York City, Paternal Grandfather; Luis Delgado Sr. from Edinburg. Preceded in death by paternal Grandmother Leonor Delgado (1997), Maternal Grandfather Camilo G. Reyna (1988), Maternal Grandmother Aurelia Reyna (1995), Maternal Uncle Rolando C. Reyna (1983). Surviving him are numerous aunts and uncles: Sylvia (Ronnie) Hatton; Irma (Eddie) Villarreal; Roberto (Mary) Delgado; Margarita Delgado Salas; Mauro (Noelia) Delgado; Hermila (José) Rodríguez; Juan (Lucy) Delgado; Luis (Carmen) Delgado; Raquel (J. R.) Gaitán; Gloria (Isaac) Santos. Román is also survived by numerous cousins and friends who love him and hold him dear. Román was a junior at Nikki Rowe High School, he loved playing football, fishing, hunting, snow-boarding and skating. Visitation was held on Monday, October 29, 2007, from 3 p.m. to 6 p.m. at Rivera Funeral Home in McAllen, Visitation resumed from 7 to 7:30 p.m. at Holy Spirit Catholic Church, 2201 Martin Ave. in McAllen, with a Holy Rosary held at 7:30 p.m.
Mass was celebrated on Tuesday October 30, 2007, at 4 p.m. at Holy Spirit Catholic Church in McAllen. Pallbearers wer Alex Gonzalez, Marcos Ramos, Justin Delgado, Vincent Delgado, Roland Villarreal, Román Villarreal, Ryan Delgado and Isaac Santos. Honorary Pallbearers were Ricco Delgado and Rudy Dan Delgado. In lieu of memorial contributions or flowers the family would appreciate outdoor plants for a memorial garden. Funeral services entrusted to the care of Rivera Funeral Home 1901 Pecan McAllen Texas. Former Advance News publisher Gene Wendorf passed away at the age of 80 during the early hours of Friday, October 19, 2007, after two weeks spent battling pneumonia. Gene was born August 8, 1927, and grew up during the lean depression years in a small town in east-central Wisconsin, where his dad, the banker, managed to keep shoes on his feet (when the bank finally reopened following the 1929 financial collapse), and his mom, food on the table. After graduating from Valders High School, Gene attended the University of Wisconsin–Madison, where he earned a bachelor’s degree in journalism. From there, he moved around the Midwest, working for a variety of newspapers and magazines as advertising salesman, ad director, editor, including the Des Plaines Suburban Times, and a group of suburban Chicago newspapers owned by Time, Inc. In the early 1970s, he and his family moved to Virginia Beach, where he served as publisher for two newspapers, before moving back to Wisconsin where he worked as advertising director for the Burlington Press. 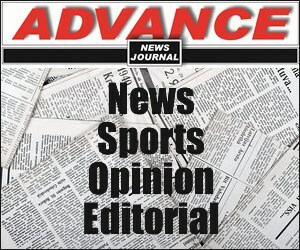 In March 1978, tired of working for other people, Gene and his wife, JoAnne, an RN who gave up nursing to join her husband in the newspaper business, pooled their resources and left the cold climes of Wisconsin and moved to San Juan, Texas, and began publishing the San Juan Advance, later changed to the Advance News Journal. Back then, few people thought the newspaper with the tiny office across from the old San Juan Post Office would last for more than a few months – tiny town, tiny paper. But thanks to the support of local business people and local politicians who thought the community would be better served with a voice of its own, the newspaper grew into a successful venture. In 1993, Gene and JoAnne sold the Advance News Journal to their son, Gregg, and his wife, Jan. Their plans, however, for a happy retirement on South Padre and travel through the U.S. and Mexico were cut short when Gene’s beloved wife, JoAnne, developed ALS (Lou Gehrig’s Disease), which eventually killed her in early 1995. Grieving her loss, looking for something to occupy his time, Gene returned to school in the fall of 1995 and began work on his master’s degree in communication at UT-Pan Am, which he completed within the next two years. After earning his advanced degree, he stayed at Pan Am and taught communication courses (mostly speech) for the next six years before retiring for good in 2002. In fact, as Gene moved into his twilight years, he was certain that age discrimination existed. But he could never prove it. During the mid-2000s, Gene’s life evolved into the curse of so many elderly people – days made up of doctors visits, trips to medical clinics, blood transfusions, in and out of medical transport vehicles stuck in a wheelchair, until finally he grew tired to the point of exhaustion. But he could still take satisfaction out of his lifelong passion and love for the Green Bay Packers, who could still find ways to occasionally make their fans happy. In fact, football, baseball, and college basketball provided respite from doctors visits, blood transfusions, and up until he caught pneumonia on October 4, he was still playing the weekly football pool with his good friend, Bill E. In fact, this year, they won it twice. Before he caught pneumonia, he was still reading three newspapers per day, watching the NFL, and listening to the Chicago Cubs disappoint their fans. Gene leaves behind his two sons, Greg and John; two daughters-in-law, Jan and Barbara; two grandsons, Gregg Loren and Clint; a granddaughter, Candi Albair; a cousin he dearly loved, Anne DeLauney; a nephew, Ken Beck; his Sunday driving buddy, George Regester; George’s wife, Virginia; two friends/former employees whom he loved dearly, Diana Sosa and Rubén Acosta; and countless Valley friends, including the many friends he met (residents and staff) during his last two years in residence at the Bridges Assisted Living Facility. The family wishes to thank all of the many friends who offered their prayers and heartfelt condolences during this difficult time. All funeral plans remained private. Democratic state representative candidate Eddie Sáenz of Edinburg, who earlier this fall did not rule out voting for a Republican for Speaker of the House, on Thursday, October 25, clarified his position, and promised he would support the election of a Democrat for that powerful position. The Speaker of the House, which is elected every two years by the 150-member-House of Representatives, has the power of life and death over all legislation, and decides which House members get the most powerful committee chairmanships and appointments. Sáenz also reiterated his support for Proposition 15, a state constitutional amendment that if approved by voters on Tuesday, November 6, would authorize the investment of $3 billion in state spending, over the next 10 years, to seek cures for cancer. Sáenz’ comments were delivered before several hundred area residents during his campaign kick-off, held at Trenton View, a banquet facility. Sáenz, an Edinburg civil engineer long involved in area political and business affairs, is challenging Rep. Aaron Peña, Jr., D-Edinburg, for state representative of House District 40, which includes all but southwest Edinburg, La Joya and Sullivan City in western Hidalgo County, Edcouch, Elsa, La Villa, and San Carlos in eastern Hidalgo County, and northern Hidalgo County. Peña defeated Sáenz in their first match-up in the 2004 Democratic Party primary. During that race, Peña portrayed Sáenz as being too close in his philosophy to the Republican Party. But late last year, Peña became one of about a dozen Democrats who chose to support the reelection of Tom Craddick, a Republican from Midland, as Speaker of the House. Sáenz is hoping that Peña’s loyalty to the GOP Speaker will help oust the incumbent Edinburg legislator. Sáenz, whose father is currently battling cancer, also pointed out that Peña was the only Democrat to vote against legislation last May that allows Texans to vote for the proposed $3 billion cancer research plan on November 6. In laying out some of his own legislative agenda, Sáenz took aim at what he believes are weaknesses in Peña’s service as a legislator. Sáenz supports a teacher pay raise, dismissing the $500 annual pay raise given this year by the Legislature as being an insult to the profession. He also said he would work to expand CHIP, the Children’s Health Insurance Program, to make it easier for more working families to qualify for the popular and affordable medical insurance program, which helps families who make too much money to qualify for Medicare or other government programs. Sáenz also pledged to work on behalf of all portions of House District 40, instead of favoring one city over another. Sáenz was joined at his campaign kick-off by his wife, Sandra, daughter Cassandra, and parents, siblings, and in-laws. Notables also in attendance included: Mayor Joe Ochoa and Councilmember Gus García, Jr. of Edinburg; Mayor Billy Leo on La Joya; Hidalgo County District Attorney Rene Guerra; Jaime Chavana and Robert Peña, Jr., members of the Edinburg school board; and Saúl García, a member of the Edcouch-Elsa school board, who was a former top assistant to Peña. 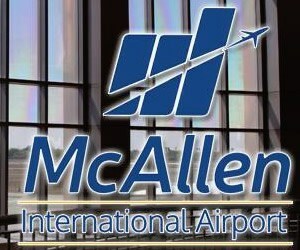 •Sáenz is the owner and chief executive officer of one of South Texas’ leading civil engineering firms. He is an expert in helping cities, school districts, and others develop vital public services for the public good. •Sáenz currently serves as chairman of the Board of Governors of the Edinburg Regional Medical Center and Edinburg Children’s Hospital, an award-winning network of acute-care hospitals specializing in children’s care and cardiovascular health. He also served as chairman of Avance, a non-profit organization whose focus is to strengthen families. Avance helped initiate the CHIP enrollment process in the Valley. 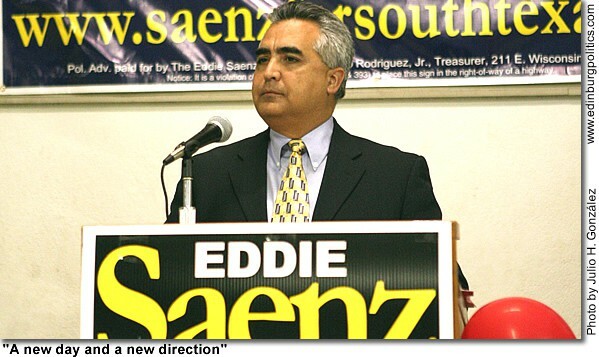 •Sáenz is former chairman of the Edinburg Chamber of Commerce, a former member of the board of directors of the Edinburg Economic Development Corporation, a former member of the Texas Border Infrastructure Coalition Transportation Committee, and a former member of the Edinburg 2020 Action Committee. •Sáenz earned his degree in civil engineering from the University of Texas at Austin in 1982. He is a member of the National Society of Professional Engineers, the American Society of Civil Engineers, and the Texas Society of Professional Engineers. A recently surfaced YouTube video is causing problems for District 40 legislative candidate Eddie Sáenz, his opponent, Rep. Aaron Peña, Jr., D-Edinburg, said Tuesday, October 30. Sáenz initially made news headlines shortly after announcing his candidacy with a charge of DWI, Peña said in a news release issued by his campaign. Because of more recent events, Sáenz faces an equally tough second controversy, the incumbent lawmaker believes. The center of the newest controversy was Sáenz’ inflated press statements that also appeared on his website that he had over 400 people at his kick-off, Peña said. Sáenz’ campaign kick-off, held at Trenton View in Edinburg, a banquet facility, was from 6 p.m. to 9 p.m.
Peña said those claims came into dispute by locals who attended the event, and were the subject of much discussion over the Internet. Video of the event surfaced and appeared on YouTube, a website that allows users to post and share short videos. The video caused a firestorm on the Internet because it clearly shows less than 100 people present, Peña said. Valley bloggers have had “a field day at Sáenz’ expense” as a result of being caught in an outright deception, Peña said. Comments on RGVote.com, a South Texas Blog, have been scathing in their attack on Sáenz’ deception, the lawmaker said. As of October 30, Sáenz had not issued an apology or retraction for the deceptive statements, Peña said. The video can be found at http://www.youtube.com/watch?v=BMg-11mJGow. Eddie Sáenz held his campaign kick-off for state representative, House District 40, on Thursday, October 25, at Trenton Point in Edinburg. What follows is a transcript of his speech. 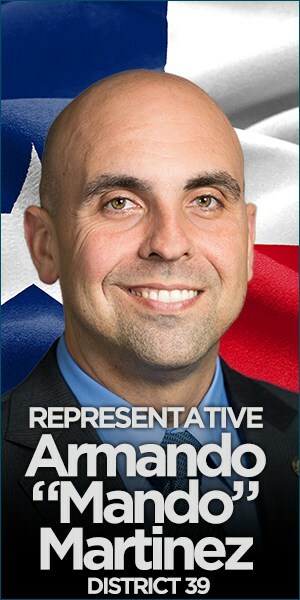 He is running for the March 4 Democratic Party primary election against incumbent Rep. Aaron Peña, Jr., D-Edinburg. House District 40 is in Hidalgo County. Peña has announced his campaign kick-off, which is also free and open to the public, for Thursday, November 8, at the ECHO Hotel, 1903 S. Closner Boulevard in Edinburg. The event will be held from 6 p.m. to 8 p.m. Thank you for being here. Today, I am officially announcing that I am your candidate for the Texas House of Representatives for District 40. Our campaign is going to offer hope for all communities, united for a positive change. Our vision is simple: it is a new day and a new direction. It’s time to have a representative in Austin who wants to be part of the solution. I am your community leader who brings diversity and who will make decisions based on the district’s needs and concerns. As chairman of South Texas Health System, I know what it takes to provide health care. A lack of insurance hurts working families, not only in the pocketbook, but in maintaining your health. That’s why I provide health care benefits for my employees, and I want to do the same for small businesses. As past chairman of AVANCE, I know what it takes to sign up children to the CHIP program. We need to continue to fight to make this program more accessible to all families. We need to loosen the restrictions and raise the income level requirements. Let’s make sure our children don’t stay at home ill. Let’s keep them healthy, to attend school to learn, and become more production members of this community. As past chairman of the Edinburg Chairman of Commerce, I know that economic development is the engine that drives our economy. We need to continue to bring new jobs to all areas of this district. For this county to remain strong and vital, we need to work together to strengthen all communities. As a former member of the site-based decision management committee for the Edinburg school system, I am aware of the challenges of our educators, and what they are dealing with the educate our kids. We need to make our schools safer for our kids so they can learn. This is Red Ribbon Week, and a solution needs to be found to keep our schools clean from drugs. We need to secure our schools from weapons, and keep our kids and parents at ease, that they are safe, as well as our educators. We also need to try to get our teachers another pay raise. With utilities high and gas prices up, and health premiums even higher, the $500 increase that they received barely got them to where they were coming out even. We need to give them more, and work that into the budget. As an engineer, I know what it takes to build communities. Communities need master-planning and infrastructure. They need this to maintain services and prepare for future growth. Infrastructure attracts businesses, which create a bigger tax base and increased revenues for government services. Finally, as a small businessman, I know what it takes to meet a payroll in the real world, to meet budgets and deadlines, to be competitive in today’s market, to understand what families at all income levels are having to face day-in and day-out. Our campaign is about preparing the trust that has been broken, so that our communities can get stronger, and our families can get healthier. It is about bringing back respect to you, and this district. It is about being accessible and staying aware of the needs of this district. Our campaign will also chart the distance between what the incumbent has promised, and what he delivered. He said he was going to Austin to change it, but Austin changed him. 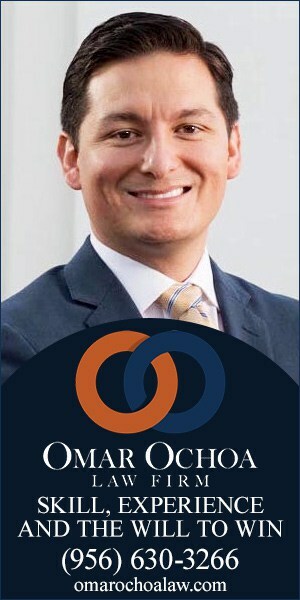 As a freshman legislator, he broke quorum, along with the Democratic colleagues, and fled to Oklahoma to protest redistricting. This time, he fled from the House floor during the voter ID bill, instead of defending our rights to vote. As a freshman, he was considered an environmental supporter, with 100 percent rating. This time, he received the lowest rating of any Democratic legislator, with a 33 percent grade. As a freshman, he called himself a hard-core Democrat. This time, he has separated himself again, and seconded the nomination for a Republican to be the Speaker of the House. This past session, my opponent co-authored a bill to bring $3 billion in cancer research over the next 10 years. When it came time to vote for his own bill, he voted against it, and was the only Democrat to vote against it. On that note, I do urge each and everyone of you to vote for this issue. It is Proposition 15. We have all been touched by cancer, and we have to find a cure. My mother has survived it, my father-in-law succumbed to it, and my father currently has it. It is something that touches each and everyone of us. Please go out and vote for it. My opponent was quoted in the Monitor as saying this past session, “My work is done.” I don’t think any legislator’s work is ever done – When health care premiums are up 53 percent, when 1.4 million children have no health insurance, when we are still fighting to keep our principles as Democrats. That’s why I am asking our voters and taxpayers of District 40 to unite behind me, your community leader, for a positive change. 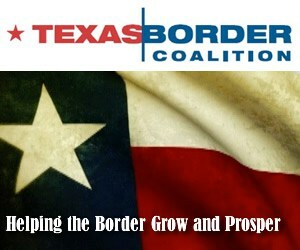 Our great state senators and South Texas representatives need a partner working with them in Austin. We need to elect a Speaker who is for everyone. That is why I am committing to stand with the Democratic Caucus, and support a Democrat for Speaker that we can all stand behind. No more squeezing middle-class families who work hard and play by the rules. No more punishing eligible children by stripping them of their health coverage. No more running as a Democrat, but voting as a Republican. Let’s bring back this district to its constituents, let’s bring this district back to you. It’s a new day, in a new direction. Let’s go there together. According to a report released on Monday, October 30, from the non-partisan government watchdog group, Texans for Public Justice, Rep. Kino Flores was one of three Democratic supporters of Republican Speaker Tom Craddick to receive $10,000 from a millionaire Republican donor who used a third party PAC with close ties to the Speaker to obscure the source of the funds. According to the report, 87% of HillCo PAC’s funds came from Bob Perry, a major Houston home-builder who gave over $6.7 million to political campaigns last election cycle and is a heavy promoter of a right-wing political agenda that includes school vouchers and tort reform. The report shows HillCo PAC funneled $30,000 divided evenly to Kino Flores and two other so-called “Craddick D’s,” the term commonly used for House Democrats who support the Republican Speaker. According to Texans for Public Justice, HillCo PAC is run by key Craddick lieutenants and is known to be the primary conduit through which Perry provides campaign contributions to elected officials who walk lock-in-step with his agenda. While Flores (D-Palmview) brags about his ties to Craddick, recent political events suggest that the Speaker is quickly losing his grip on power. Two former Craddick D’s announced their opposition to the Speaker, another announced his retirement and a fourth is challenging him for the Speaker’s seat. Hundreds of fans of the latest inductees of the Tejano Walk of Fame, set to be held in Edinburg on Thursday, November 15, will be able to see their favorite musicians – at no charge – during the public portion of the popular event, say organizers. The public and private portions of the event will be hosted by The Social Club, an upscale-restaurant, located at 205 Conquest Boulevard. Héctor Casas, an area developer and businessman, is donating the use of The Social Club for the 6th Annual Tejano Walk of Fame. 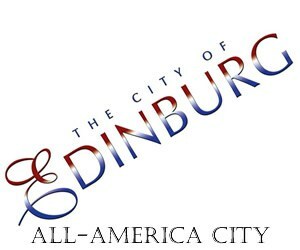 Following the 6 p.m. public induction ceremonies, which will be held outside The Social Club in Edinburg, at 7 p.m., sponsors and other paying supporters will participate in a private celebration, inside the restaurant, where they will pay up to $5,000, which includes dinner for a table of 10, to hear a concert held in honor on the inductees. That $5,000 donation, designated as Star Sponsor, will allow a representative from the Star Sponsor to read an autobiography on an inductee and then have the honor of presenting the inductee their award. A Table Sponsor is also available for $1,000, which includes dinner for a table for 10 inside the restaurant, plus the concert. Individual tickets to enter the private celebration, which also will feature an individual dinner, are $100 apiece. 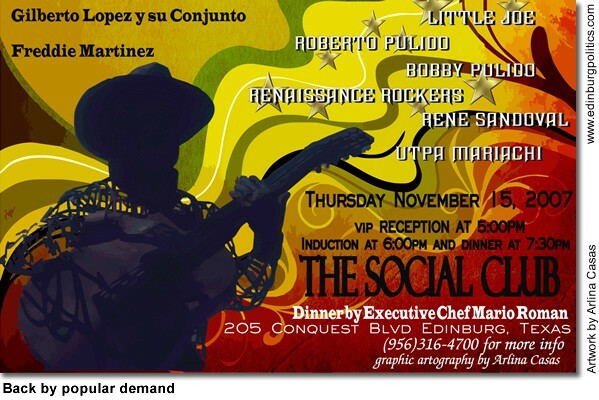 The meals will be prepared by executive chef Mario Román. The donations, including individual ticket purchases, are tax-deductible, organizers say. All proceeds from the private portion of the function will be donated to the José Roberto Pulido Scholarship Endowment, named after the Tejano music icon from Edinburg, which helps provide money for needy students who are majoring in music at The University of Texas-Pan American. Generally, Tejano music is described as roots-based hybrid of traditional Mexican music styles, including rancheras, polkas, and cumbias that also incorporate blues, pop, and country music elements. Gilberto López y su Conjunto of Edinburg; and Freddy Martínez of Corpus Christi. The private concert, which will be held inside The Social Club, will include performances by Little Joe y La Familia, José Roberto Pulido, his son, Bobby Pulido; the Renaissance Rockers; The UTPA Mariachi; and René Sandoval. 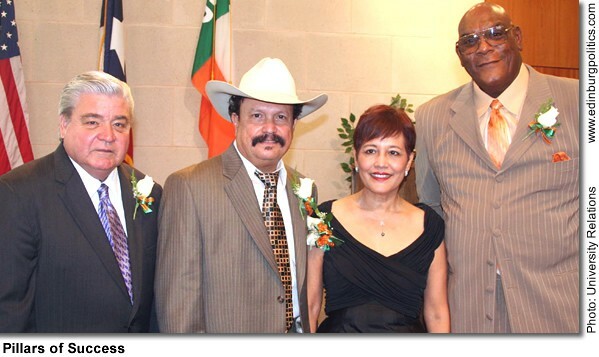 González Family Funeral Home; Dr. Dahlia Guerra, Dean of the College of Arts and Humanities at UTPA, and sister to former Mayor Richard García; Mary Patlán with the Edinburg city government; Flaco Pulido, a brother of Roberto Pulido; and Johnny Torres, a spokesperson for the Hidalgo County Health Department. In 1999, the Tejano Walk of Fame was created by a citizen’s advisory panel organized by Mayor Joe Ochoa and the Edinburg City Council. Located on the grounds of the Edinburg Auditorium at 415 W. McIntyre, the Tejano Walk of Fame features a sculpture by Richard Hyslin that honors Edinburg native José Roberto Pulido, a pioneer in Tejano music. For five years, at least five Tejano music stars from throughout Texas were honored during elaborate ceremonies that included an indoor concert at the auditorium, preceded by the stars’ official induction, which included the laying of marble pavers with a star and their names engraved. The annual event, which was discontinued in 2004, was credited by city officials as helping draw thousands of visitors to the Walk of Fame. Additional information on the event is available by calling 316-4700. Gov. Rick Perry, Lt. Gov. David Dewhurst and Speaker Tom Craddick on Tuesday, October 23, announced an agreement to allocate $99 million for the state’s share of health benefits, a one-time $55 million transitional payment for FY09, and the development of an incentive funding program for community colleges. The agreement affects faculty and staff at South Texas College, as well as taxpayers in Hidalgo and Starr counties. Additionally, leadership offices reached an agreement on the appropriate definition of proportionality to include only those community college employees actually paid with state funds. “I am pleased a consensus was reached on appropriate health benefit funding. And, I am encouraged that we not only clarified the truth-in-budgeting standard for community colleges, but we were also able to place a greater emphasis on achievement through incentive funding,” said Perry. Sen. Juan “Chuy” Hinojosa, D-McAllen, whose legislative district includes South Texas College, said the governor had make a mistake when he had vetoed state funding for the health insurance premiums of community college employees. “Earlier this year, Gov. Rick Perry vetoed $154 million in funds appropriated by state lawmakers to pay for community college employees’ health care, forcing many local colleges to consider tuition hikes, program cuts, and property tax increases,” Hinojosa said. Hinojosa was appointed by Dewhurst as part of a working group to formulate a solution to the community college funding crisis. These funds will be allocated through a combination of budget execution or other existing transfer authority by September 1, 2008. Any funds removed from another appropriation for this purpose will be restored through a supplemental appropriation when the Legislature reconvenes in January 2009. Additionally, the governor, in consultation with the lieutenant governor and Craddick, R-Midland, will appoint a task force to make recommendations, to be considered by the 2009 legislature, on how future incentive funds should be allocated. Also, leadership commits to exploring future incentive funding increases for higher education. As part of the agreement, the governor, lieutenant governor and speaker will ask community colleges to rescind tuition, fee or tax increases adopted in FY08 and any tuition, fee, or tax increases under consideration for FY09 that have been designed to offset the original veto. Popularity of the Bachelor of Applied Technology in Technology Management at South Texas College has led the college to expand offering a new bachelor’s degree opportunity. Students will now be able to earn a Bachelor of Applied Technology in Computer and Information Technologies from the college. This makes STC the only community college in Texas with approval to offer two bachelor’s degrees. STC received official approval to offer the program from the Texas Higher Education Coordinating Board on October 25th and will start classes in spring 2008. The THECB provided approval at its quarterly board meeting following an extensive review process. “This is a reaffirmation that STC has become a world-class institution with the finest students and faculty in the nation,” said Dr. Shirley A. Reed, STC president. “We are providing premier educational and workforce programs in response to the needs of the region and serve as the catalyst for regional economic prosperity and social mobility. 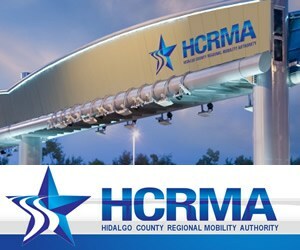 According to the U.S. Bureau of Labor Statistics, CIT related vacancies are expected to increase by 58 percent throughout Hidalgo and Starr counties by 2015, a substantial increase that must be addressed within the local workforce. The new Computer and Information Technologies BAT Program will prepare students for a variety of career opportunities to fill this void including computer and information system managers, computer system analysts, database administrators, and network system and data communication analysts. Through the program, students have access to free tutoring in a variety of subjects, flexible course schedules, financial aid, a student support club, leadership activities, internships, mentorships, business networking events, job placement and a variety of other resources to ensure their academic and personal success. The college graduated its first class of 15 BAT students in May 2007. There are currently more than 215 students enrolled in the college’s BAT for Technology Management Program. Thirty-nine of those students are expected to graduate in May 2008. For additional information about South Texas College’s BAT Program call 872-7270 or visit http://www.southtexascollege.edu. An exhibit titled “Pillars of Success” featuring the photos and success stories of five distinguished alumni of The University of Texas-Pan American opened at the University’s Visitors Center on October 11. Four of the five honorees were able to attend the reception before family, friends, and University employees and students, where the pillars were unveiled. Pillar nominees are submitted to the Visitors Center Exhibits Committee who then makes recommendations for final selections to the President’s Executive Committee. The current “Pillars of Success” will be on display for the next two years. William F. Garrison, major general, U.S. Army – Garrison, who earned a bachelor’s in business administration from then Pan American University (PAU), became the youngest U.S. Army officer ever to hold the ranks of colonel, brigadier general and major general. He was the commanding officer of Operation Gothic Serpent, the military operation launched in 1993 to capture Mohamed Farrah Aidid, which ended by the Battle of Mogadishu on Oct. 3, 1993. He retired Aug. 3, 1996. Sam Shepherd portrayed Garrison in the film “Black Hawk Down,” which chronicles the events of Battle of Mogadishu. Garrison, who is on assignment in Africa, was represented at the ceremony by UTPA ROTC Colonel Christopher Rivers. Arturo E. Guerra Jr., retired attorney-at-law/district judge – After receiving his Bachelor of Arts in social studies and government from PAU, Guerra went on to law school and practiced law for a number of years prior to assuming the position of county court-at-law judge. After four years he was appointed judge of the 275th District Court, which he held until 1987. 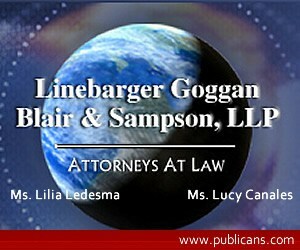 He also served as corporate counsel for CoSTEP until 2006. Now retired from the legal profession, Guerra serves on numerous community boards and participates in his family’s fourth generation ranching business. Dr. Marla M. Guerra, South Texas ISD superintendent – Guerra received her post-bachelor’s work at the University and spent her early years in social work before becoming a teacher. Before joining South Texas ISD in October 2001, she was an assistant professor in the UTPA Department of Educational Leadership. She has spent 23 years of her career at PSJA Independent School District, where she served as a teacher, principal, district planning coordinator, and administrator. Under her leadership, the STISD became one of only five recognized districts in the region for the 2006-2007 academic year. Roberto Pulido, Tejano music recording artist – He attended PAU on a music scholarship and earned a bachelor’s degree in music. After teaching for a while, Pulido launched his musical career with the creation of Roberto Pulido y Los Clasicos and has been on the forefront of Tejano music for more than a quarter of a century. Pulido, or “El Primo” as he is known to his many fans, won his first Tejano Music Award for male vocalist in 1980 and has captured countless others since. He continues to support higher education for South Texas music students through the many scholarship fundraisers he has held. UTPA Provost and Vice President for Academic Affairs Dr. Paul Sale along with Dr. John Edwards, UTPA vice president for Enrollment and Student Services, led the ceremony. Sale referred to the five honorees as great leaders in their fields and as visionaries. “Simply put they are overachievers … and the pride of UTPA. All will serve as great examples for the thousands of elementary, middle school, high school and University students who walk through this Visitors Center every year,” he said. For more information on this exhibit or upcoming Visitors Center exhibitions, call 956/381-2956. With recent local and national news reports of a serious form of staph infection in schools and communities throughout the country, officials at The University of Texas-Pan American are working diligently to ensure a safe and healthy environment on campus. Staph infections, including Methicillin-resistant Staphylococcus Aureus, (MRSA) which is a type of bacteria that is resistant to certain antibiotics, occur most frequently among persons in hospitals and health care facilities who have weakened immune systems. MRSA is primarily a skin infection which often resembles a pimple, boil or spider bite, but quickly worsens into an abscess or puss-filled blister or sore. Director of Student Health Services Rick Gray wants the campus community to know that adopting habits of good personal hygiene and taking proactive measures are the most important factors in reducing the spread of MRSA and many other disease-causing organisms. Posters are now being displayed around campus to reiterate good hygiene tips and educate the campus community. All buildings on campus are equipped with hand washing facilities and hand soap for use by all staff, faculty, and students, he said. The sharing of personal items such as towels, razors, cosmetics, and bar soaps should be avoided. “In the health services facility, we have disinfectant and hand washing supplies and equipment at every treatment station in the clinic. All staff is trained on a regular basis in infection control procedures and compliance with those procedures is monitored on a regular basis,” Gray said. Additionally individuals should keep open skin lesions such as boils, insect bites or cuts covered with a clean dry dressing, he said. Use a barrier such as a towel or clothing between your skin and shared equipment and take a shower if there is significant skin to skin contact after an activity such as a basketball game. 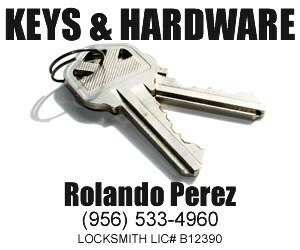 For more information, contact Gray at 956/381-2511. The Humane Society of the United States has honored Sen. Juan ‘Chuy’ Hinojosa, D-McAllen, with its prestigious ‘Humane State Legislator Award’ for sponsoring and guaranteeing passage of new regulations that protect Texans and their animals by providing animal welfare workers increased training and resources to do their jobs. Hinojosa sponsored Senate Bill 1562 during this spring’s legislative session. The bill called for training requirements for animal control officers working for city or county governments, including at least 12 hours of continuing education per year. 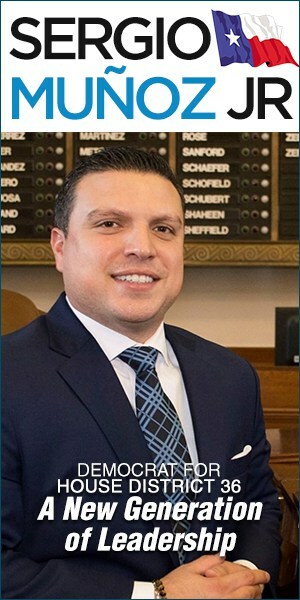 In addition, Hinojosa’s bill set higher standards for animal shelters and impoundment facilities to ensure humane treatment of all animals and increased penalties for those convicted of harming police service animals. The Humane Society of the United States has more than 456,000 supporters in Texas who work toward the protection of animals in the United States. Hinojosa has represented South Texas for more than two decades in the House of Representatives and the Texas Senate. A former Marine who served as a squad leader in Vietnam from 1966 to 1968, he earned his bachelor’s degree in political science from Pan American University in Edinburg and his law degree from Georgetown University in Washington D.C.. Earlier this, year, Hinojosa received the Public Servant of the Year Award from the Coalition of Texans with Disabilities, the Patient Advocacy Award from the Texas Academy of Family Physicians, and a special recognition award from the NAACP for his work to reform the Texas Youth Commission. Commended for his legislative leadership and support of law enforcement, Sen. Eddie Lucio Jr., D-Brownsville, was presented the Senator of the Year 2007 award at the thirty-first convention of the Combined Law Enforcement Associations of Texas (CLEAT) in Brownsville on Saturday, October 6. CLEAT is Texas’ largest police officers’ union, and the state’s largest legal services provider for law enforcement officers. Founded in 1976 by 400 police officers from across the state, the organization now boasts more than 15,000 members and nearly 100 affiliates across Texas, including in Brownsville, Harlingen, McAllen, Kingsville and other South Texas towns. Charley Wilkison, Director of Governmental and Public Affairs for CLEAT, said, “Sen. Eddie Lucio is a leader when it comes to law enforcement issues. Not only does he listen to his officers back home in South Texas but he also seeks out the voices of law enforcement from all over the state. His reputation of looking out for law enforcement is known all over Texas. As a member of the Senate Finance Committee, Lucio pushed for an increase of $369.4 million in funds for the incarceration and treatment of adult felons. He also helped secure $108 million for border security operations, including funding for local law enforcement surge operations, joint operation and intelligence centers, a border security operation center, additional Department of Public Safety troopers and more aviation support. Rep. Rubén Hinojosa, D-Mercedes, on Thursday, October 25, released the following statement applauding the passage of the Children’s Health Insurance bill by the House of Representatives. Earlier this month, the President vetoed a previous version of the bill that would have provided health care coverage to 10 million low-income American children. Republicans claimed that the vetoed measure would have covered undocumented immigrants, adults, and children from high-income families. The Thursday, October 25 compromise effectively addresses those complaints by clarifying rules to verify citizenship, phasing out childless adults within one year, and ensuring that no families earning above 300 percent of the poverty level receive SCHIP benefits. The new bipartisan comprise also still provides quality, affordable health care to 10 million low-income kids. The Senate is expected to consider the legislation this week. “SCHIP is critical to our nation’s interests and to the millions of children whose families cannot afford health insurance. In Texas, over twenty percent of our children—approximately 1.4 million kids—are currently not covered. Our state is home to more uninsured children than anywhere in the nation. This is a moral travesty and an unacceptable failure of our nation’s leadership. “The SCHIP program invests in our children and our future. It cost-effectively insures kids so that fewer taxpayer dollars have to go toward emergency room treatments – the most expensive way to care for a child’s health. In Texas, this bill would make sure that nearly 1 million children receive the care they need, including 440,000 eligible kids who still live day-to-day without access to health care. Following the second failed attempt on Thursday, October 25, by Democrats in Congress to pass their version of an SCHIP reauthorization bill through the House of Representatives by a veto-proof margin, U.S. Sen. John Cornyn, R-Texas, renewed his call for Democrats to end their political gamesmanship and work with Republicans on a bipartisan SCHIP compromise. “Despite all the political attack ads and partisan posturing, Congress finds itself in the exact same place as two weeks ago – without an SCHIP bill to help Texas’s and America’s low-income kids. The American people deserve better. “Right now in Texas, there are approximately 500,000 Medicaid-eligible children who are not covered by Medicaid and an additional 200,000 SCHIP-eligible children who are not enrolled to participate. Yet, in Washington D.C., some in Congress would rather engage in political parlor tricks instead of working together to resolve our differences and pass a bipartisan bill. On October 11, Cornyn sent a letter to Senate Majority Leader Harry Reid and House Speaker Nancy Pelosi urging them to reconsider their decision to shutdown negotiations on SCHIP. Cornyn wrote, in part, “If you believe that covering low-income children in Texas and across the country, requires more than the 40 percent funding increase that Republicans have introduced, I am more than willing to work with you to find a reasonable, bipartisan solution. But, reauthorization of SCHIP is too important to be used as a political pawn for campaign purposes. Cornyn serves on the Armed Services, Judiciary and Budget Committees. In addition, he is Vice Chairman of the Senate Select Committee on Ethics. He serves as the top Republican on the Judiciary Committee’s Immigration, Border Security and Refugees subcommittee and the Armed Services Committee’s Airland subcommittee. Sen. Juan “Chuy” Hinojosa, D-McAllen, has been honored with the Texas Medical Association’s “Texas Medicine’s Best Legislator” award for his efforts to restore CHIP funding, improve childhood immunization rates and provide more accountability and transparency in contracts between physicians and health plans. He, along with Sen. Judith Zaffirinni, D-Laredo, were among 10 state lawmakers honored by the organization. The award ceremony was held in Austin on Friday, October 19 at the TMA Fall conference. Hinojosa spearheaded efforts during the 80th session to draft legislation that would require HMOs to provide more transparency in their contracts with physicians so that important changes in their insurance policies could be clearly understood. Hinojosa was also a Senate co-sponsor of HB 109 which restored CHIP funding, so that 130,000 additional children could receive health benefits. TMA President William W. Hinchey, MD, said that Hinojosa was instrumental in improving health care for Texans. “From helping children in dire need of health care, to improving Texas’ overall wellness — Senator Hinojosa has been a true champion,” Hinchey said. TMA is the largest state medical society in the nation, representing more than 42,000 physician and medical student members. TMA has 120 component county medical societies around the state and has been in existence since 1853. America’s largest state medical society has presented the award to legislators following each legislative session since 1995, for their work to improve the health of all Texans. Sen. John Carona (R-Dallas) — Carona led the effort to ensure physicians are appropriately reimbursed by health plans when they join an in-network group, and he blocked efforts to weaken portions of the 2003 medical liability reforms. Rep. Warren Chisum (R-Pampa) — As chair of the 29-member committee that oversees the state budget, Chisum helped create much-needed increases in funding for health care programs, including $2.3 billion in general revenue funds for Medicaid services to address caseload increases and other health care initiatives; $1.8 billion to fund the settlement of the Frew vs. Hawkins Medicaid lawsuit and create more patient access to physicians; $89.5 million to change Children’s Health Insurance Program (CHIP) eligibility standards; and $82 million in general revenue to increase the availability of mental health crisis services. Rep. Byron Cook (R-Corsicana) — Cook provided strong leadership on an issue of critical importance to medicine: protecting the medical liability reforms enacted in 2003. He also supported other patient-friendly initiatives, including CHIP funding restoration and creating better transparency in health care, and applied a common-sense approach to such issues as stem cell research, end-of-life care, and creating better transparency in health care. Rep. Dianne White Delisi (R-Temple) — Delisi carried more than two dozen successful health bills. She was behind the 80th legislative session’s omnibus Medicaid reform bill, hospital-acquired infection reporting legislation, a bill strengthening protections against Medicaid fraud, and a broad package of measures designed to enhance the use of information technology in health care. She also worked to expedite physician licensing and to regulate discount health care programs. 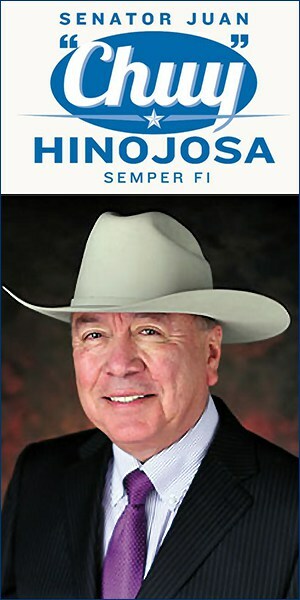 Sen. Juan “Chuy” Hinojosa (D-McAllen) — Hinojosa led the effort to provide more transparency and accountability in contracts between physicians and health plans, and he was directly involved in efforts to restore CHIP funding, improve childhood immunization rates, and address Texas’ childhood obesity epidemic. Sen. Jane Nelson (R-Lewisville) — Nelson repeatedly has stood as a champion for medicine and Texas patients. She worked to ensure cancer funding and CHIP reform this session, and her Medicaid reform package expands efforts to assist with premiums for the uninsured, encourages patients to see physicians rather than go to emergency rooms for appropriate care, and focuses heavily on preventive health, which will help minimize acute care costs and help Texans maintain good health. 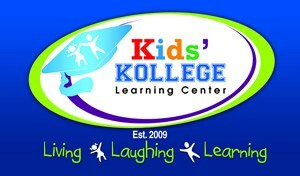 Her legislation also promotes wellness by increasing physical education in elementary school. Rep. Sylvester Turner (D-Houston) — Turner helped ensure an estimated 127,000 children will have access to health care. He was the author and champion of House Bill 109, which removes CHIP’s administrative barriers. Sen. Carlos Uresti (D-San Antonio) — Throughout his career, Uresti has demonstrated unwavering support for Texas’ patients, physicians, and medical care facilities. This session he was a key supporter of restoring adequate funding for both CHIP and children’s Medicaid. He also worked to increase the number of medical residents and residency programs. Sen. Judith Zaffirini (D-Laredo) — Zaffirini’s legislative highlights include passing historic legislation authorizing $1.9 billion in capital funding for 48 Texas colleges and universities, the largest single investment in higher education to meet Texas’ growing needs. As a member of the 2007 Appropriations Conference Committee, she was also instrumental in writing the final $153 billion state budget, which included significant increases in health and human services funding. Rep. John Zerwas, MD (R-Richmond) — Zerwas’ legislation requires health insurers to extend network benefits to physicians who join an in-network medical group while their credentialing application is being processed, lowering patient costs. He also cosponsored legislation requiring health insurance plans to be more transparent in dealing with patients. TMA is the largest state medical society in the nation, representing more than 42,000 physician and medical student members. It is located in Austin and has 120 component county medical societies around the state. TMA’s key objective since 1853 is to improve the health of all Texans. I do not know a single student or family who believes a college degree is too cheap. If you agree that higher education should be accessible and affordable for Texas families, please join me in voting for Proposition 2 on Nov. 6. Many of us have worked for years to make a college education a reality for all students, and it will take you only a minute to help. By supporting Proposition 2, we can make the dream of attending college a reality for thousands of low- and middle-income students. As Chair of the Senate Higher Education Subcommittee, I believe it is critical that citizens vote yes on this important measure that will provide millions of dollars for the education of our children without requiring an increase in local or state taxes. More than 40 years ago Texas voters approved a constitutional amendment authorizing the Texas Higher Education Coordinating Board to use general obligation bonds to help finance low-interest, affordable loans for college education. Since then, these bonds have helped generations of Texans by providing more than $1 billion in affordable student loans. This program, which predates many federal financial aid programs and private college loan opportunities, has been a tremendous boon for thousands of students. In the last 10 years alone, more than 58,000 Texans cumulatively received approximately $659 million in low-interest loans to help pay for college expenses. Proposition 2 will extend the Coordinating Board’s bonding authority to continue this important program. Because the rising costs of attending college and the increasing number of college-bound students are quickly diminishing the program’s financial reserves, this is critical. If Texas voters fail to approve the measure, funding for these student loans could run out by 2009, according to the Coordinating Board. As a result, many of today’s high school sophomores would not have this critical financial assistance to pay for their future college expenses. At a time when having a higher education degree is more important than ever, we can make no better investment for our students or for our future than providing access to low-interest loans approved by Texans, administered by Texans, for the benefit of Texans. What’s more, because the bonds used to finance these loans are repaid by those who borrow the money, Proposition 2 will have no impact on our local property taxes, sales taxes or any other tax collected by the state. For the sake of our students and the future of higher education in Texas, I strongly and respectfully urge Texas voters to vote yes on Proposition 2. Rep. Rubén Hinojosa, D-Mercedes, has been named the first recipient of the Institute for Financial Literacy’s “Visa Legislator of the Year for Excellence in Financial Literacy Education” Award. 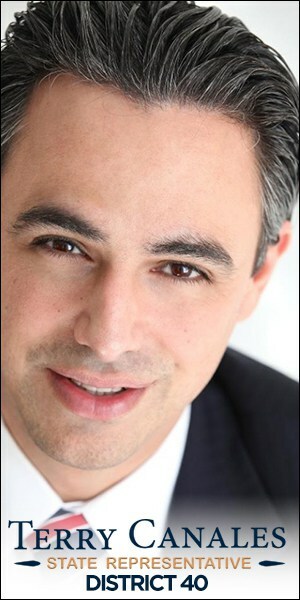 Hinojosa is the co-founder and co-chair of the House of Representatives’ Financial and Economic Literacy Caucus. The Caucus provides a forum for Members of Congress to promote successful policies and advance financial literacy and economic education. “Congressman Hinojosa has not only been a tireless champion of financial education but through his leadership has helped to shine a national spotlight on the problem of financial illiteracy and how best to combat it,” said Jason Alderman, director of financial education for Visa Inc.
“Congressman Hinojosa was the clear choice to win this award because of his tireless passion and dedication to a critical issue of financial education,” said Leslie E. Linfield, the Executive Director and Founder of the Institute for Financial Literacy. As part of its second Annual Conference on Financial Education, The Institute for Financial Literacy has created the Excellence in Financial Literacy and Education Awards to recognize individuals who have displayed an exceptional commitment to supporting and bringing a creative approach to personal finance learning. The Institute’s “Visa Legislator of the Year for Excellence in Financial Literacy Education” Award is given to the elected official who has made a significant difference in improving the financial literacy level in America. A Potter County grand jury has issued public corruption charges against three suspects, two of whom were indicted for illegally using their senior positions at the Potter County Sheriff’s Department for personal gain, Texas Attorney General Greg Abbott has announced. According to the indictments, Potter County Sheriff Michael C. Shumate, 58, accepted illegal bribes from the county’s jail food service and commissary vendor, Mid-America Services Inc. Former Chief Deputy Kenneth R. Farren, 55, faces unrelated charges of misusing county employee and inmate labor for his personal gain. Charges against a third individual, Robert W. Austin Jr., 53, the president of Mid-America Services, stem from allegations that he and his company used bribes to obtain contracts with the county. Shumate and Farren are surrendering to Attorney General’s investigators today at the FBI office in Amarillo. The investigation that led to the Wednesday, October 17 indictments began with the FBI, which referred corruption allegations to the Office of the Attorney General. Evidence obtained by the FBI indicated that Shumate and Austin were engaged in an illegal scheme to ensure Mid-America was awarded and retained the county’s jail food service and commissary contracts. The Potter County Attorney’s Office referred the investigation of Farren to the Office of the Attorney General. According to the indictments, Austin and his Dallas-based company, Mid-America, secured the commissary and food service contracts with Potter County by providing valuable inducements to Shumate. The alleged inducements included cash and checks, out-of-state trips, laptop computers, meals, clothing and other items of value. The indictments also charge Shumate with unlawfully accepting checks from Mid-America Services. It is alleged that corporate checks were not reported on Shumate’s campaign finance reports, which the Texas Election Code requires county elected officials to file with local authorities. Former Chief Deputy Farren faces two separate abuse of official capacity charges for his use of county employees and jail inmates for projects that personally benefited him at his home. Further evidence was obtained Tuesday when investigators with the Office of the Attorney General and the FBI executed a search warrant at Farren’s home.